April is National Poetry Month, and we're helping to celebrate with an afternoon of poems. We'll be reading some of Jack Barnes poems, recently donated to the SHS, and inviting participants to bring their favorite poem to share with the group. Bring your own work if you are among the poets of Sebago! Malaga Island off the coast of Maine is the site of a sad and shameful episode in local history, where a community of mixed-race families were forced from their homes in 1912. Join us to hear Kate McBrien, Chief Curator of the Maine Historical Society and curator of an award-winning exhibit about the remarkable people who created this unique island home and the political and economic events that led to their demise. 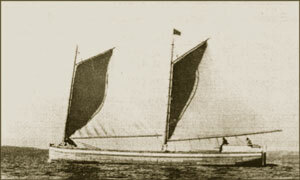 Learn of Sebago's connection to this story. Our third annual running of this wildly popular event! Featuring Glenn Grant, our own resident antiques expert. Bring items to be appraised and discussed, $5 per item. Join us for demonstrations of 19th century crafts, a presentation on heirloom apple varieties, and viewing of items in the Display Shed. 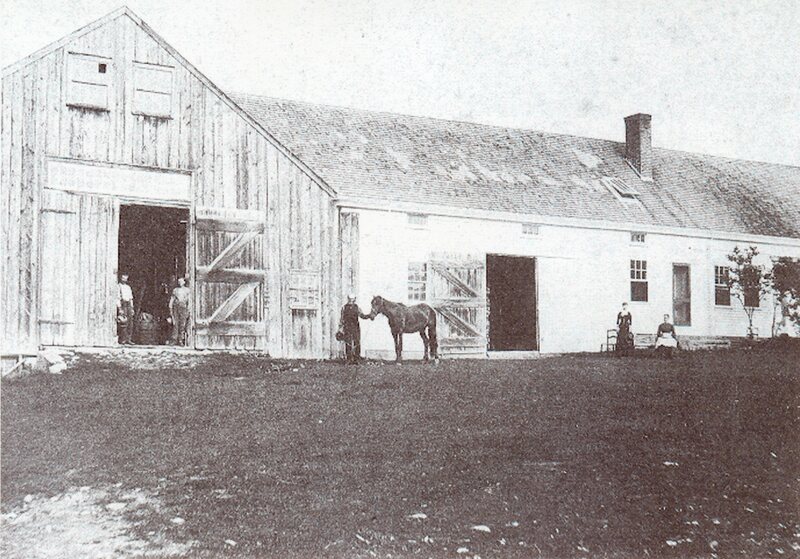 Visit Pike Yard to learn about the history of one of Sebago's earliest families. Bring a picnic and hike up to "Pike's Peak" for magnificent views across hills and mountains. Rain date: Sun Oct 20. Wayne Peabody will join us for a presentation on the exploration of Sebago Lake to find the remains of World War II planes that crashed in the lake in May 1944. 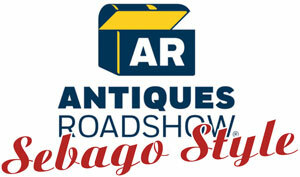 Bring your recollections of Sebago during WWII! Also featuring our ever-growing slide show of Sebago veterans through history. The Historical Society is honored to present Roby Dyer with the Boston Post Cane, given to the oldest citizen in town since 1909. A reception and refreshment will follow the ceremony. 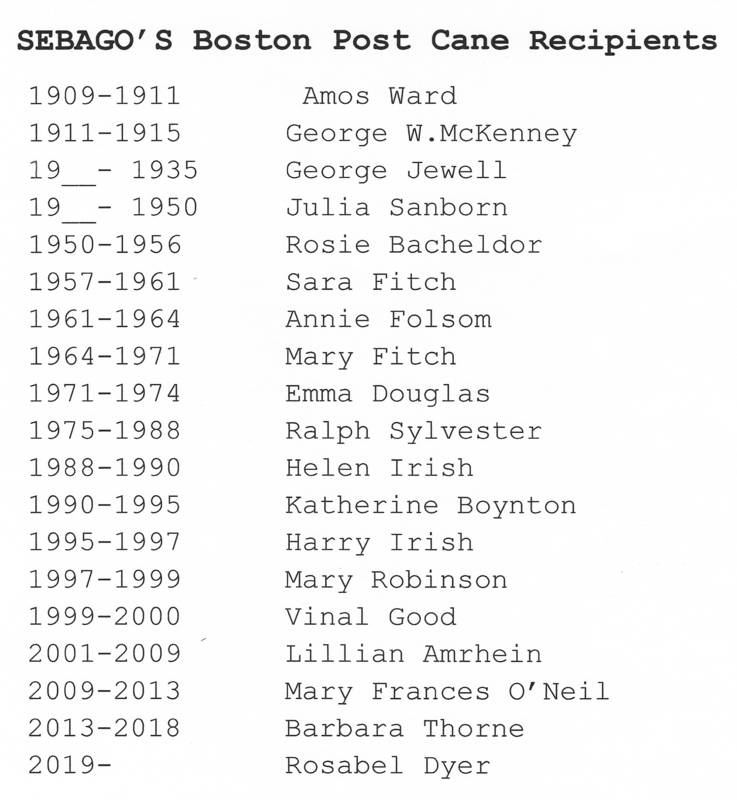 See a list of recipients of the Cane since the tradition began more than a hundred years ago. For more information on the Cane, see the Boston Post Cane Information Center. In an ongoing project, we are continuing to gather photos of service men and women who have lived in Sebago. We'll show the slide show of all the photographs we have been able to assemble so far, from the Civil War to the present. If you have any to add, please contact us! They don’t have to have enlisted from Sebago, just to have lived here at some point in their life. Also, we'll run a video of last year's presentation by author Walt Bannon, who talked about his book The White Pocketbook, the extraordinary story of his mother's experiences in Nazi-occupied Belgium and her marriage to an American serviceman. 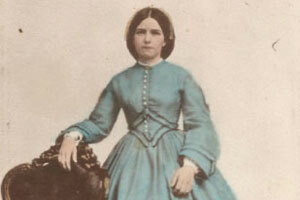 Other war brides and children of war brides added their memories. Something new this year will be a tour through the Haley Cemetery just before Halloween. First get psyched up for Halloween at the Town Hall Halloween party on Saturday Oct 27th - and then continue in the spirit of things for our Sunday cemetery tour! Historical Society members will tell stories about interesting characters, we'll look at some notable graves in the cemetery and we’ll keep an eye out for ghosts. After the tour, Halloween treats will be available. Come dressed for Halloween fun and watch out for spooky Sebago characters! We will again feature cider pressing, ice cream making, wool spinning, and sock making, and other skills from a much earlier time. Our display shed will be open to view our larger items. This year's Tour takes us to the Jackson Farm at the foot of Poor's Hill. Built in 1849 by Daniel Johnson Hill, grandson of the first settler in Sebago and a member of the first generation to be born and raised here, the farm was run for many years by Daniel's daughter Ella and her husband Thomas Jackson. More recently it has been known as the Jordan Hill Farm. The house and barn have been recently renovated and furnished with period fixtures. Tour includes a discussion of the families who have lived here and their place in Sebago's history. Local author Caroline Grimm will introduce us to her newest book The Old Squire, which is the latest in her Voices of Pondicherry series. In them she chronicles the history of South Bridgton, in which Sebago residents played a big part. Our most popular program from 2017 returns! Glenn Grant, antiques and collectibles expert, and longtime resident of Hogfat Hill, will join us for our very own Roadshow. He will appraise your interesting items and family keepsakes for $5.00 per item. Glenn began collecting antiques at age 12 and has been pursuing them throughout his 75 years. He has sales spaces at the Cornish Trading Co and Antiques USA in Arundel. In a continuing project, we are gathering photos of service men and women who have lived in Sebago. Click to view a slide show of all the photographs we have been able to assemble so far. If you have any to add, please contact us! 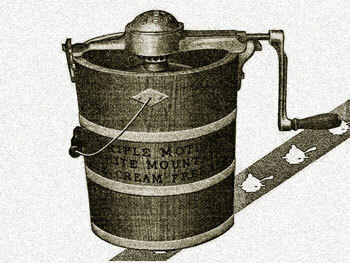 Help churn ice cream and press apples into cider. See demonstrations of spinning, axe-sharpening, letterpress printing and other traditional skills. Bring your own apples to press, or purchase apples and cider from local orchards. 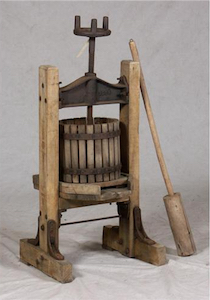 Browse the museum’s collection of historical artifacts. Local residents in traditional attire will interpret artifacts and lead activities. This year we take an in-depth look at one extraordinary property that holds a significant place in Sebago's history: the Poor homestead, at the crest of Hillside. Built around 1802, it was the home of the Poor family for over 200 years, and the childhood home of the famous muralist Jonathan D. Poor, nephew of Rufus Porter. Tour the house, barn and private cemetery. 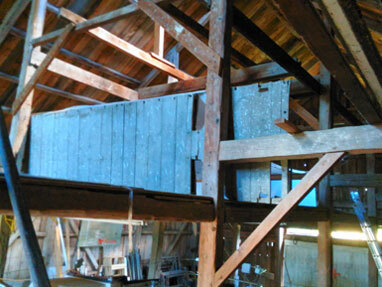 Included in the tour is a talk and slide show on the Poor family by local historian Susan Cummings, a discussion of the murals with artist Sandy Howe, and an examination of the barn’s artifacts. Dave Tanguay, who brought us the popular "Steamboats on Sebago" program last summer, returns with more about our local waterways. The Cumberland and Oxford Canal opened in 1830 connecting Portland with Harrison and beyond via a network of rivers, lakes and 28 locks. Using old maps, photos and new satellite imagery he explores the canal as it can be found today. Free admission, donations gladly accepted. Glenn Grant, antiques and collectibles expert, and longtime resident of Hogfat Hill, will join us for our very own Roadshow. He will appraise your interesting items and family keepsakes for $5.00 per item. Glenn began collecting antiques at age 12 and has been pursuing them throughout his 75 years. He has sales spaces at the Cornish Trading Co and the Barnfull in Saco. Free admission, donations gladly accepted. 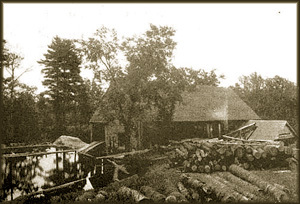 William Fitch, one of Sebago's original settlers, started a sawmill on the Northwest River, a business which existed into the 1950s. His descendant, Richard Fitch Foley, will discuss the history of the mill and lead a tour of the site where it stood. Please join us for this event, which is free and open to the public. Join Dave Tanguay of Windham and explore the history of steamboats on Sebago and Long Lake from 1846 to the 1930s as the Lakes Region became the Switzerland of America. A Power Point presentation using many postcard images from the period. Please join us for this evening event, which is free and open to the public. Please email contact@sebagohistoricalsociety.org for reservations and visit us on Facebook (search for Sebago Historical Society) for more information. An $8.00 donation to the Sebago Historical Society is appreciated. 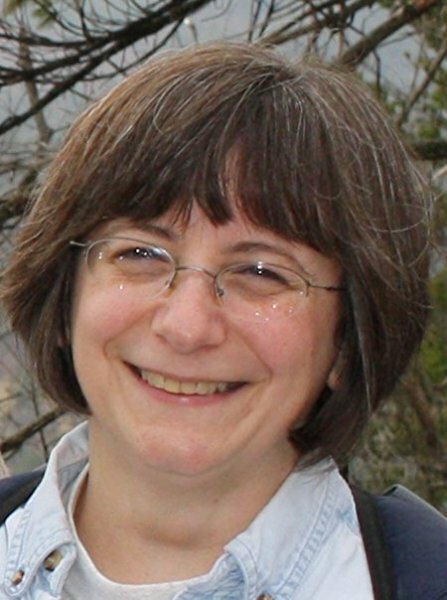 Linda Griffin of the Windham Historical Society will share with us her knowledge of the poor farms, or town farms, that were in existence in the early years of all Maine towns. There were laws governing the establishment and maintenance of poor farms that Linda will explain. Members of the Sebago Historical Society will also present information on our own Sebago town farm, including some very interesting facts that are being uncovered. Please join us for this evening event, which is free and open to the public. Jim Merry, bottle diver and digger will discuss his work. Using a powerful metal detector Jim can detect and locate antique glass because of the lead contained in old glass. He has collected many interesting objects from Sebago Lake and other lakes and ponds in the area. He will be sharing his stories and finds with us during this Saturday afternoon event. Please join us. This is a free public event, donations gratefully accepted. Subscribe to receive news of upcoming meetings and events.